Wilma Grace Leighton, daughter of Alba Jacob Leighton and Estella Blanche Osborne, was born May 8, 1902 in Taylor Co., Iowa and died Nov. 7, 1978 in Corning, Adams Co., Iowa. 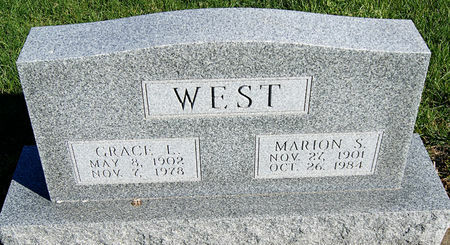 She married Marion S. West Mar. 4, 1926 at Corning, Adams Co., Iowa. He was born Nov. 27, 1901 in Holt Twp., north of Gravity, Taylor Co., Iowa, son of Edgar West and Aurora E. Heatherington, and died Oct. 26, 1984 in Omaha, Douglas Co., Nebraska. Searching for WILMA GRACE LEIGHTON WEST in Taylor County Iowa?